They cover an area larger than Texas. “We were able to measure over two million kilometers of rivers that were wider than 30 meters,” says George Allen, an assistant professor of geography in the College of Geosciences at Texas A&M University. For the rivers that were too narrow to accurately measure from the satellite images, the researchers applied a novel statistical technique that utilized the fractal characteristics of river networks. 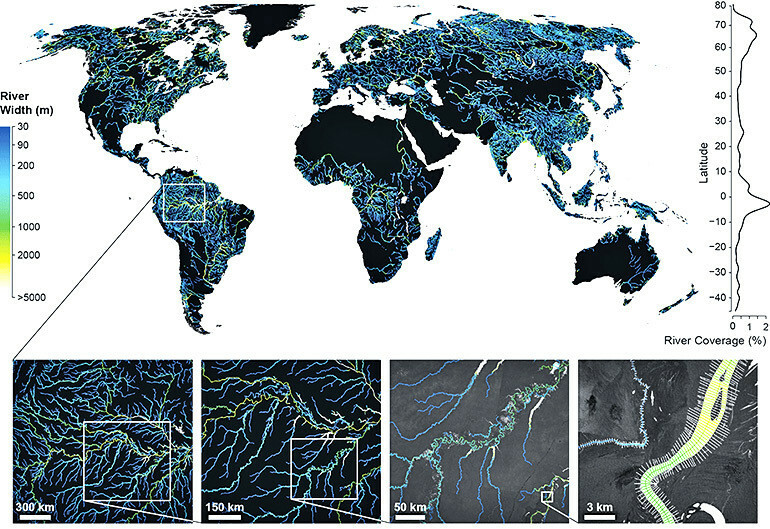 “There are many more narrow rivers than wide rivers, and we found that the relationship between river length and width is actually pretty predictable,” Allen says. On the other hand, the researchers estimated that the surface area of rivers and streams in many developed parts of the world was less than expected. Rivers and streams naturally emit significant amounts of greenhouse gases to the atmosphere. A key factor in estimating the amount of gas released is the amount of surface area occupied by rivers and streams (also called the fluvial network). “A greater global total surface area implies that rivers and streams contribute more gases to the atmosphere like carbon dioxide and methane than currently represented by carbon cycling models,” he says. The GRWL Database already is being used for other purposes such as improving flood models and classifying surface water bodies, including lakes, canals, and rivers. “We think of this database as a first step to a lot more work,” Allen says. Researchers will use the database as a core dataset for the upcoming NASA Surface Water and Ocean Topography Satellite mission that will measure changes in river and lake water height globally. The research appears in Science. Researchers at the University of North Carolina at Chapel Hill contributed to the work. The project was funded by NASA.